Mera Peak 17 days trek is a Hard level trek. Travelers who can walk up to 6-7 hours a day on an uphill and downhill trail will find this trek fulfilling. It is best that we prepare ourselves for the Annapurna trek by jogging and exercising regularly at least a month prior to the start of the trek. Trekking to the Everest Base Camp should be relatively easier for those who have experience walking/trekking in a high altitude environment. Past hiking experience would be an asset but no technical skill is required for this trip. It is also important that we consult our doctor. Participants with pre-existing medical conditions such as heart, lung, and blood diseases should inform Discovery Mountai Trek before booking the trek. 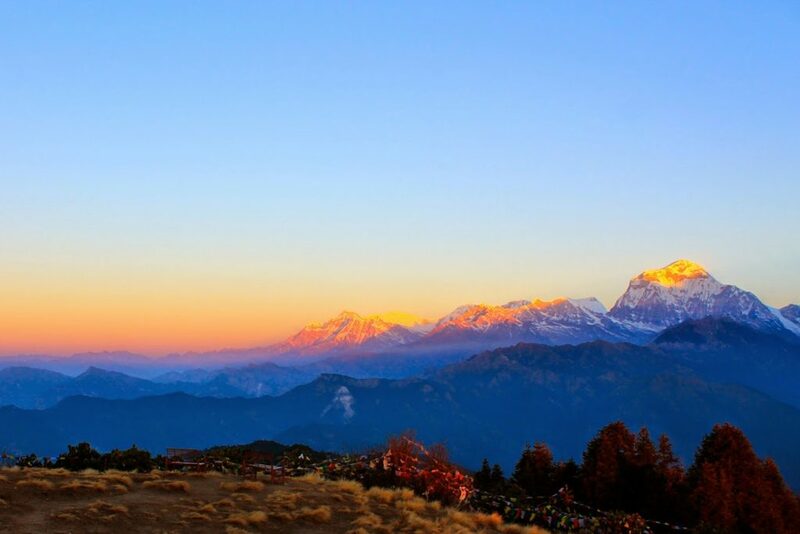 The best time to trek to the Mera Peak Trek is Spring (February to May) and Autumn (September to November). The temperature is moderate in these seasons and guarantees amazing views through the trip. Although this trek can be undertaken during winter, the cold temperature might not be suitable for everyone. Mera Peak is the highest trekking peak of Nepal at 6,461 meters. It is situated in the Everest Region reaching up to the valleys of Hongu and Hinku. Climbing this peak requires some technical skills and also demands that you closely follow the instructions given by your personal team leader. Once at the summit, you can have amazing views of eight-thousanders like Cho-Oyu, Everest, Lhotse and Makalu. Mera Peak climbing adventure from Discovery Mountain Treks is a popular program that takes your trekking in Nepal experience to a new height. 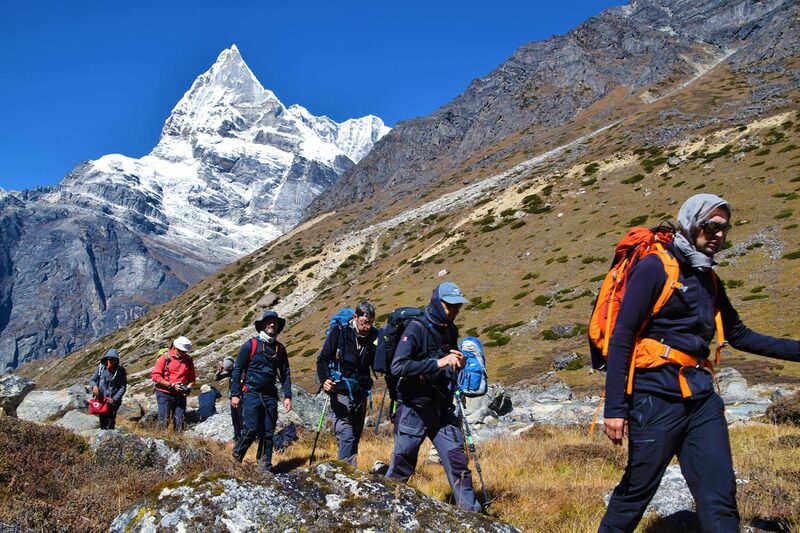 In fact, the real gist of this program is the combination of trekking and climbing activities – both in a single program! While this might not be a climbing adventure for beginners, it is indeed a good starting point for amateur climbers who want to have an experience on the higher peaks of Nepal. The program kicks off with a flight to Lukla. It’s a 40 minute flight from Kathmandu, taking you from the hustle and bustle of the city instantly into the renowned mountain village of Lukla. From Lukla, you will trek through the amazing Khumbu Valley, mountain passes, beautiful forests and glaciers at higher altitudes before ascending Mera Peak via Mera High Camp. Our experienced team leader will guide you and train you properly along the way for a successful ascent of Mera Peak. They will fix ropes and make the path where necessary. They will also ensure that you are properly acclimatized and are confident enough to take on the challenge. Since your safety is our utmost concern, a climbing program such as this demands extra care and attention. We go through lengths to ensure that you successfully and safely ascend Mera Peak even if you are currently not skilled at climbing. Leave that to our team leaders – they will let you train properly before the attempt. 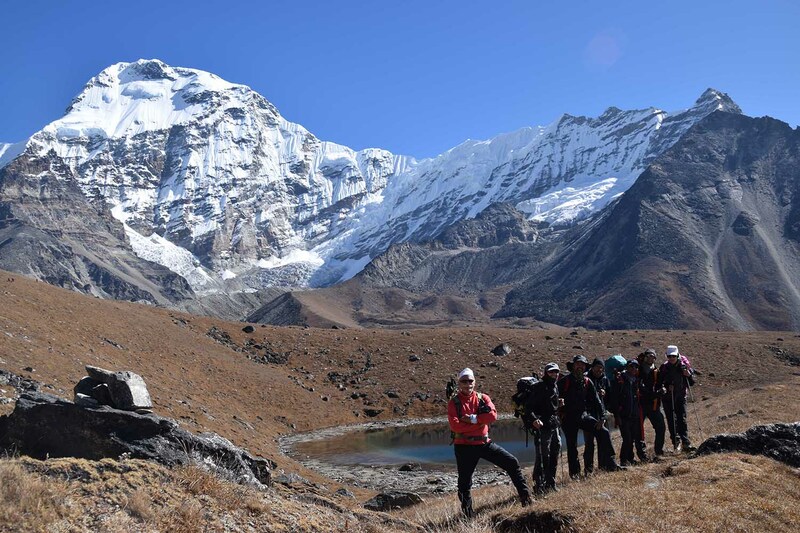 Book this trip Discovery Mountain Treks early, as the best seasons to climb Mera Peak is in spring and autumn – for a memorable trekking and climbing experience in the Everest Region of Nepal. In the morning, we take a flight from Kathmandu airport to Lukla. The flight takes around 40 minutes, which is scenic. From Lukla, we start our walk towards Paiya. First we go through forests, cross the bridge of Handi Khola before reaching the village of Surke and later to Paiya via Chutok-La. Stay overnight in Paiya at 2,730 meters. The trek today is five to six hours. Starting from Paiya, we climb down the path, cross a little bridge and head towards Karki-La Pass. Take care as the trail sometimes gets slippery depending upon the weather condition. Trek through some beautiful forests of bamboo and the Valley fo Dudhkoshi until you arrive at Panggom, a village at 2,846 meters – where you will stay for the night. After an early breakfast, we head towards Ningsow, the next stop on our trail. Passing through Panggom-La Pass, we get on an ascending path and later cross a river named Peseng Kharka Khola. From there, ascend the hill called Peseng Kharka Danda, cross Ningsow Khola, and arrive at Nigsow at an altitude of 2,863 meters. Overnight stay at Ningsow. We begin the day along an ascending route, followed by a gradual descent until arriving at Ramailo Danda. This hill has wonderful views of Mera and Salpa peaks. On this day you will briefly enter into Makalu-Barun National Park, with chances of seeing a Red Panda. From here, get on the Pasang-Lhamu Trail up to Chhatra Khola, where we stay for the night. The trek duration today is around six to seven hours. We begin by taking the main trail of Mera Peak, cross Majang Khola and take a route along Hinku Khola. From there the trail turns towards Tashing Ongma, while we continue on the trail. Next, we cross the Sanu Khola before arriving at Kothe. Kothe is at a an altitude of 3,691 meters where we will stay overnight. Today we trek along the ridge of the Hinku Khola beneath the Mera Peak. The trek is short today with less than four hours in total. Arriving at Gondishing, we will take a stop and later walk at a leisurely pace to arrive at the 200 year old Lungsumba Gompa with a mani rock. Leaving behind the Gompa, we continue the trek to reach the high-altitude pasture of Thanknak. After breakfast, we follow the trails of a moraine to Dig kharka, from where you can have amazing views of Charpate Himal. Our trail then ascends through moraines to the apex of Hunku Nup Glacier and Shar Glacier. Then we climb along a steep trail to Khare at 5,405 meters, where we stay overnight. Today we take a day of rest for the purpose of acclimatization and let our bodies adapt to the high-altitude environment. On this day, we take short hikes around, and also engage in the training procedure. We will learn to use ropes, Harness, crampon and ice axe. It’s going to be an exciting day learning the basic mountaineering skills. Start early as we have a difficult walk to Mera High Camp. It takes around six to seven hours through steep trail. First we walk though a trail with boulders to reach Mera Base Camp. With a bries stopover, we trek up to Mera-La Pass and climb further up to the Mera High Camp. From the High Camp, you can enjoy spectacular views of Cho-Oyu, Everest, Lhotse, Nuptse, Barutse, Makalu Kanchanjanga and other peaks. Go to sleep early. Today is an exciting day as will be scaling Mera Peak. The climb up to the summit and back to Khare will take around eight to nine hours. Wake up past midnight (around 1 AM), have a quick breakfast and start the walk toward the peak. The weather will be chilly but as the sun begins to rise over the mountains, it will be a scenery to behold and never forget! Closely follow your team leader as you approach the summit. If needed, he will fix a rope to get to the summit at 6,461 meters. Once there, you will relax in satisfaction, and enjoy great views of the highest mountain range in the world. Later in the morning after your camera batteries have dried up, we will climb down and trek back to Khare. Starting from Khare, we will retrace the route to Kothe. It’ll be an enjoyable walk today, taking around five hours to arrive at Khare where we’ll stop for the night. After a quick breakfast, we start early towards Thuli Kharka. The trail is a gradual uphill climb and later descends across several tributaries of the Inkhu river. We continue along the trail, pass a shorten and descend to Thuli Kharka. The elevation is 4,300 meters, and it takes around six hours to reach from Kothe. Zatra-La Pass is at an altitude of 4,610 meters. Starting from Thuli Kharka, we will gradually come to Zatra-La pass. Crossing the pass, we will come into the high valley of Lukla, surrounded by Cho-Oyu, Kongde and Numbur peaks, and a number of other giants. The journey today is around six to seven hours; and once at Lukla, relax in a hot bath and enjoy. 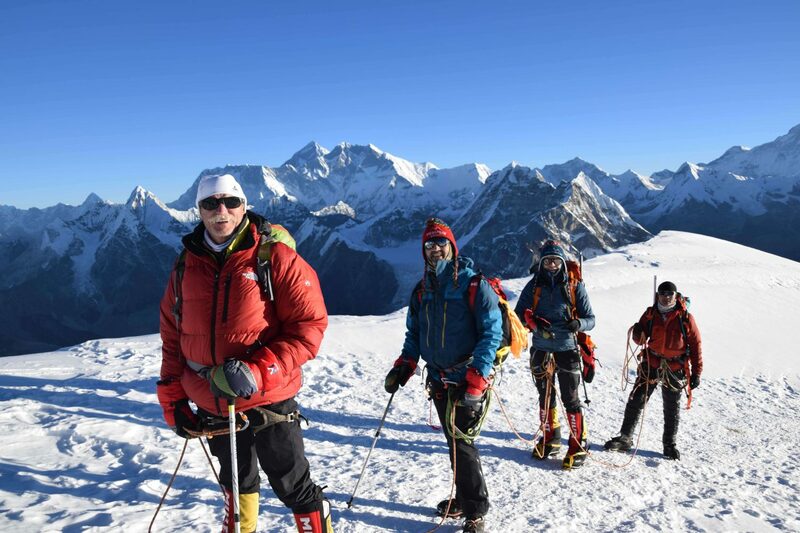 Great climb of Mera Peak with a breathtaking panorama of Everest and Makalu! Thanks to Chhiri and his team for their perfect organization and their immense kindness! To all, come and discover Nepal with #Discovery Mountain Trek And Expedition !